8 months down, and 693 books have been collectively been read for the 2nd Canadian Book Challenge! Congrats to Tara, Framed and Monica for finishing their 13 books in January. Welcome to Barefootheart who joined us this month. She may have just joined, but she does have one book under her belt already. Some authors new-to-me this month include Beth Powning, Mazo de la Roche, Melynda Jarratt, Howard Norman, Nancy Huston, Elizabeth Kelly, and Margaret Buffie. Thanks for introducing me to their books! Prize time! 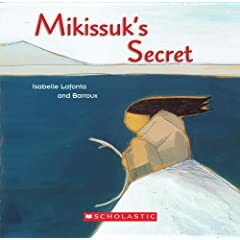 If you'd like to win a copy of Mikissuk's Secret, written by Isabelle Fontane and illustrated by Stephane-Yves Barroux, all you have to do is write in the comments a province that you'd like to visit and find a book set in that province from the list above. This is open to everyone, not just challenge participants. This month, I'm introducing a new feature to the Canadian Book Challenge updates. It's a little feature I'm calling Shout-Outs. I've asked a few notable people from various walks of life, all across Canada, to recommend 13 Canadian books. Each month I'll feature some of those suggestions. The first Shout-Out comes from Richard Van Camp, author of The Lesser Blessed, Angel Wing Splash Pattern, A Man Called Raven, What's The Most Beautiful Thing You Know About Horses? and Welcome Song For Baby. I had the opportunity to see Van Camp at a speaking engagement here in Yellowknife recently and he's a fantastic speaker, weaving very entertaining tales. Not wishing to keep his list restricted to 13, Van Camp refers to his list as "20 works by Canadian authors (so far) who make me proud to be Canadian!" Check it out. Which have you read? The Difference Engine by William Gibson. I like the new feature! And I need more reading time, obviously, if I am going to keep up with all these fine readerly people. For the contest, I'd love to visit PEI, and I'll take the easy route by citing Lucy Maude Montgomery's Anne of Green Gables. I read Getting Over Edgar for the challenge last month. I love your new feature, John! What a great idea. I've only read 3 of the titles on his list but find it so interesting discovering someone's else's must-reads. Can't wait for next month's list. With everyone's reviews plus these lists I am never going to have to worry about running out of Canadian books to read. Claire: Either leave an email at jmutford [at] hotmail [dot] com or leave a comment on any post. I've added your books above, thanks! Gypsysmom: Thanks, it's added above now. Barbara: I can't see how anyone could visit PEI for the first time without see Green Gables, so easy route or not, definitely appropriate. If I was to pick a place to visit, I'd pick Saskatchewan (represented above by As For Me and My House) and the Yukon (represented above by I Married The Klondike). Those are the only two I've yet to visit, so they're high on my priority list. Chris: Thanks, I've added it above. Melanie: Which 3 did you read? I've read Beautiful Losers (and though I'm a fan of Cohen, didn't enjoy this at all), Louis Riel (which I absolutely loved), and Three Day Road (which I enjoyed). I like your new feature too. I've read at least four from his list, including The Stone Angel, Cat's Eye, Bear and Three Day Road and enjoyed them all. I have several more of them on Mt. TBR including The Tracey Fragments that I might just pick up next. I've been neglecting my women for your challenge. For your contest, I'd love to visit Quebec and I've noticed there are lots of Quebec authors read for the challenge so I'll pick one I've read myself - Nikolski by Nicolas Dickner. Oops. Just a bit of clarification needed for my last post. Nikolski is set primarily in Montreal (as well as having been written by a Quebec author). Mikissuk's Secret is a great little book, my daughter loved it — good-luck to the entrants! Great new feature, looking forward to more. The 3 I've read from his list are Louis Riel (really interesting! ), The Stone Angel (I love this book) and In the Shadow of the Wind (I like Hebert, and although I like this one I love The First Garden most). Hello All! I'm new to the group and wanted to say a quick hello to each of you. It would appear that the only book that I've read from Richard Van Camp's list is The Stone Angel. I guess I have a lot more Canadian reading to do! As for a province I would like to visit, I hope to go to Nova Scotia sometime in the near future, and the book Audience of Chairs was set there. I'm Glad to be a part of this challenge and look forward to meeting all sorts of interesting people. Happy Reading! Sorry John, no reviews written. The stars will have to tell the story, so to speak. And if you don't mind correcting it, the first title at the bottom of my list links to the right review but the title is wrong. it should be "Ex-Cottagers in Love". Is it too late to join? I just found out about your blog from the Keepin' It Real Book Club! My goal this year (2009) was to read only Canadian books, and as I usually read 30-40 books a year, I think I fit nicely into the Challenge criteria! I'd be happy to start counting 9and reporting on) 13 books from scratch, or to let you know about what I've read since last July! Hope to be able to participate! Oh, and - great idea!!! I am hopelessly behind this year! Great new feature. There are a few on that list I totally agree with. A Carra King by John Brady. Quite a good mystery and although it is set in Ireland John Brady, originally from Dublin, now lives in Toronto so he counts as a Canadian author. I'll do a proper catch up next month when I finish the last of the Anne of Green Gables series. I haven't been reading Canadian lately but have finally got another one. I've now read # 22. The Gargoyle**** by Andrew Davidson. I like your new feature but I haven't read any on his list. I wonder what that says about me? I'm not sure if you are reading these comments while you are away but hopefully you will be able to get to them before you do your next update. Lady Oracle by Margaret Atwood. Not my favourite Atwood but lots to sink your teeth into. Kicking into full gear now to get finished. Last night I began reading Marian Engel’s last published work. After each short story I lept into the next. “This will be the LAST one before lights out” I said at page 83 and then twenty pages later. The Tattooed Woman is a beautiful collection of stories about middle-aged women coming unhinged.